Insights and Rants: Post Office faster than Telkom ADSL?! Post Office faster than Telkom ADSL?! 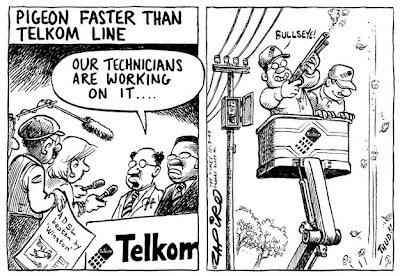 The 2009 Pigeon Race highlights yet another problem with Telkom's broadband disaster, also known as SAIX. In this race a pigeon flies a short distance to deliver 4GB data faster than a local-to-local ADSL line. It's sad that only the speed was tested in this "race". There is also the cost factor. "Broadband" in South Africa is charged by the byte, whether sending or receiving. And there are usage caps. Most users in SA only get 3GB per month unless they pay an extra R100 per GB. So the cost of sending 4GB of data is R800. My maths is correct, because the sender gets charged R400 for uploading 4GB, and the receiver gets charged another R400 to download the data. 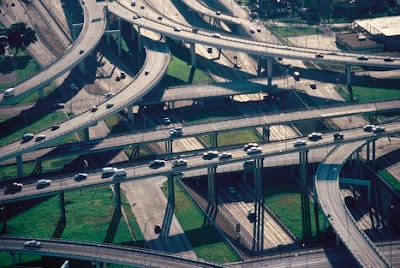 There is no discount for the fact that the traffic is local. That's assuming the file is transferred directly between the two connections, and that the user has the technical know-how to set up dynamic DNS or a VPN such as LogmeIn Hamachi. If the user is less technically literate, the cost doubles again. If the file is stored locally on a FTP server or web site, then the site owner has to pay for 8GB of traffic as well as the hosting cost. Another R800. Of course we haven't factored in the problem of regular disconnections and other reliability issues. ADSL connections are regularly disconnected and then reconnected because Telkom has decided to do it this way. The disconnect is at least once every 24 hours, even if the IP number does not change. Sometimes it's as often as every 6 hours. Sometimes the "service" stops altogether. So whatever transfer protocol you use, you'd better make sure it can handle disconnections and can resume the upload/download where it left off, because otherwise you'll never get the data to transfer. I called Speed Services Couriers, that bastion of reliability and service who went on strike for a week, (followed by an illegal strike for a second week) and asked them the cost of door-to-door delivery of a CD. R151.94, excluding packaging. The parcel must be ready fefore 3pm and should be delivered the following day before 10.30am (19hrs 30mins). The cost was Joburg to Durban. Add in the cost of the DVD-R and padded envelope, and we can do it for less than R200 in under 24 hours. Of course a "business" would never rely on a 384kbps download/128kbps upload link. One of my customers has 3 ADSL lines, each the 4MB option, but the bottleneck is still the upload speed. 4MB is the download speed. The best upload speed is nominally 512kbps on a "4MB" connection, 256kbps on a "512" connection. In the "4MB" case the upload time will drop from 73 hours to 18 hours 15 minutes, assuming no disconnects or interruptions. So if Speed Services Couriers delivers before 9.15 am, they beat Telkom's ADSL, at half the price, excluding the cost of the ADSL line rentals, which are added to the cost of the data. In my case they beat Telkom ADSL by 2 days! In fact, I think snail mail might be faster. The cost of the data is the same, irrespective of whether the data is sent locally or internationally. My www.mustang.co.za web site is much cheaper to host with WebHost4Life in the USA, because I get unlimited bandwidth and 100GB storage for $10 per month, which is the cost of up/downloading 1GB of data locally. If Telkom reduced the cost of local bandwidth, I wouldn't be tempted to upload the data to the USA, thereby clogging their precious satellite/undersea cable links in both directions. Right now I'm already using a non-local proxy server because the local one is faulty and unreliable. They even want to proxy my HTTPS traffic, which is really stupid. And of course they deny that the pigeon is faster. DUH! That's Telkom for you! Update: I have just completed uploading a data file to my web site. Transfer time: 03:57:20 with 2 interruptions and restarts. File size: 155,630k. At that rate the upload time would be 108 hrs for 4GB. And this Seacom is not benefiting us at all.